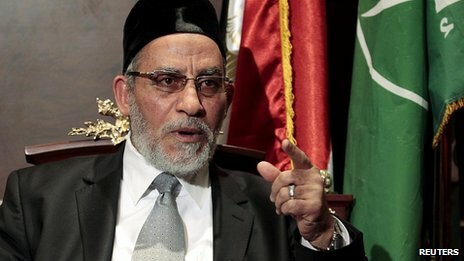 Egypt sentenced Mohamed Badie leader of the Muslim Brotherhood to a life sentence. How many remember that our president backed the Muslim Brotherhood in the “Arab Spring”. Badie was causing a ruckus for the Egyptian army. Egypt has been fighting the malicious parasite (Muz Brohood) since the late ’30s of the previous century. It warms the heart to see Egypt reject the kind of fundamentalist devolution of the historically cosmopolitan “Land of the Pharos”. No one fathom the darker recess of the Obamas heart. We do not, and cannot know his motivations for sure. What does he have to say about the revealed Brotherhoods ties with terror? Does he process such thoughts at all? It was an allegiance between a liberal democracy and a death cult against a country, (Egypt) about 7000 years through history back…. These are in Russia. Egypt got the same thing when she pissed off the Jews before! This entry was posted in History and tagged Arab Spring, Mohamed Badie, Muslim brotherhoood by jackhammerjohn. Bookmark the permalink.